The main standard for fire alarm systems is BS5839 pt1:2017. 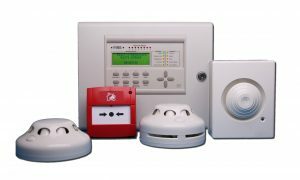 Our technician can call to carry out test and inspections along with repairs and maintenance to your fire alarm system to ensure you meet with current statutory regulations. The purpose of emergency lighting is to ensure the safety lighting is provided promptly, automatically and for a suitable time, in a specified area when the normal mains power supply to the usual lighting installation fails. The overall objective of emergency escape lighting is to enable safe exit from a location and/or building in the event of failure of the mains’ normal supply. The objective of escape route lighting is to enable the safe exit from a location or building for occupants by providing appropriate visual conditions and direction finding on escape routes, and in special locations, and to ensure that fire fighting and safety equipment can be readily located and used.